We rarely think about the role food plays in our favorite TV shows or movies, but damned if it hasn’t been crucial. But what would Ghostbusters be without Twinkies? Twin Peaks without pie? Goonies without Baby Ruth? Pixar without Pizza Planet? One artist has decided to celebrate this crucial link in a very unique way. 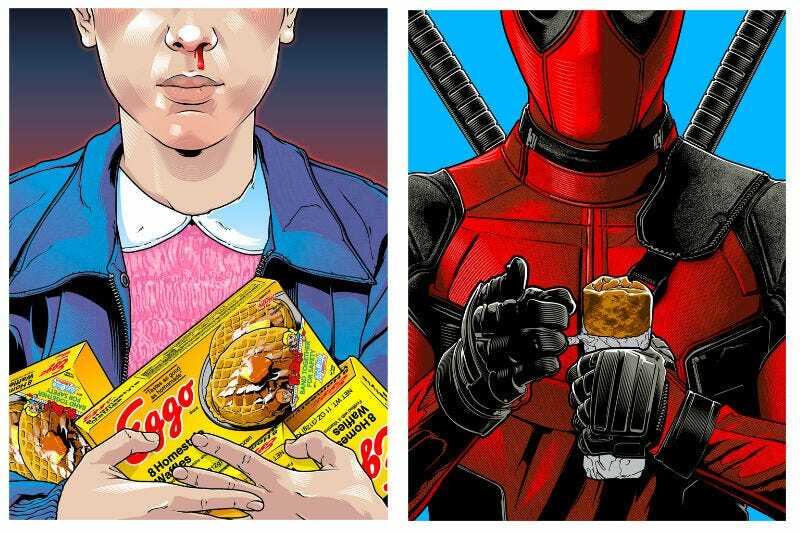 That artist is named Joshua Budich and on January 27, he’s opening Fictional Food 2, an art show focusing on your favorite food moments from TV and movies. Here are just a few of our favorites from this show. We’re pretty sure you’ll get them all instantly. And that’s just the start. The show will also feature pieces based on food from Willy Wonka and the Chocolate Factory, The Simpsons (a lot of Simpsons, actually), Ghostbusters, Pulp Fiction, Spongebob Squarepants, Lost, and many more. It opens at 7 p.m. on January 27 at Gallery 1988 East in Los Angeles. Online sales will start on January 28 and the show remains open until February 11. And yes, this being Fictional Food 2, there was a Fictional Food 1, much of which is still on sale. You can check those out (which include Star Wars, Stand By Me, Silence of the Lambs, Lord of the Rings, Pac Man, Metal Gear Solid and more) at this link.